1.1 Legal Basis. 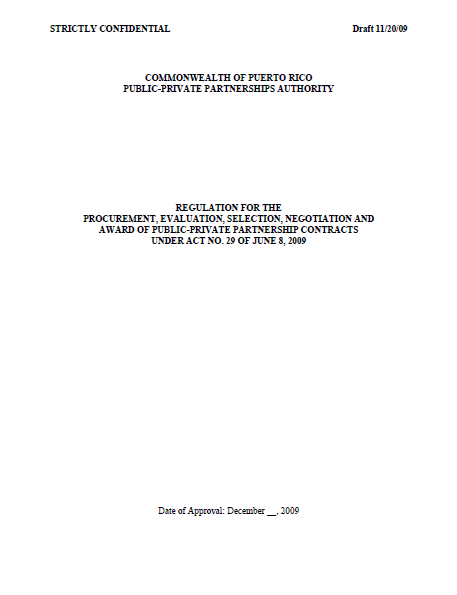 The Puerto Rico Public-Private Partnerships Authority was created by the Public-Private Partnerships Act, Act No. 29, approved on June 8, 2009, for the purpose of implementing the public policy of the Commonwealth concerning Public-Private Partnerships as contemplated under the Act. This regulation is promulgated by virtue of the power vested in the Authority by Article 6(b)(ii) [– Specific Powers] of the Act. 1.2 Purpose of Regulation. The purpose of this regulation is to establish a procurement, evaluation, selection, negotiation and award process for PPPs that is consistent, transparent, and encourages and supports a climate of private sector innovation and investment in the Commonwealth. In order to carry out the purposes of the Act, this regulation provides guidelines and procedures for, among others: (i) identifying the Functions, Services or Facilities that qualify for establishment or development as PPPs; (ii) soliciting, obtaining and evaluating PPP proposals; (iii) selecting the entities or individuals that will enter into Partnership Contracts with a Partnering Government Entity; and (iv) negotiating and awarding Partnership Contracts. 1.3 Scope of Regulation. The scope of this regulation is limited to those projects covered by the definition of a PPP set forth in the Act and this regulation. 3.1 Composition and Responsibility of Partnership Committee. The Authority shall appoint a five (5) member Partnership Committee for each PPP to assist in the selection of Proponents and the negotiation of the terms of the related Partnership Contract. The members of each Partnership Committee shall be designated in accordance with Article 8(a) [– Creation of Partnerships] of the Act. (d) two (2) officials from any Government Entity chosen by the Authority for their knowledge and experience in the kind of project covered by the Partnership under consideration. The Partnership Committee will perform the functions set forth in Article 8(b) [– Partnership Committee Functions] of the Act and this regulation. The Partnership Committee, however, will not be deemed a committee of the Board. The Authority may, in its discretion, terminate a Partnership Committee that has been duly created under the Act or replace a Partnership Committee with another such committee. The Authority may also, in its discretion, remove any member of a Partnership Committee and make new appointments to a Partnership Committee, to the extent that such removal and/or appointment is not inconsistent with the provisions of Article 8 [– Partnership Committee] of the Act. (j) to carry out any additional task related to the selection, negotiation and award procedure contained in this regulation, as requested by the Authority. 3.2 Meetings of the Partnership Committee. The Partnership Committee will meet as often as is necessary to perform its duties and responsibilities as described in Article 8(b) [– Partnership Committee Functions] of the Act and this regulation. Unless otherwise provided by the Authority, the President of the Bank or his or her authorized delegate in the Partnership Committee will act as chairperson of the committee. The chairperson of the committee will designate a Secretary, who need not be a member of the Partnership Committee, and may designate any other member of the Partnership Committee to serve as chairperson in his or her absence. The chairperson of the Partnership Committee, or the member designated by the chairperson in his or her absence, will summon all members to and preside over all meetings of the Partnership Committee, will set the frequency and length of each meeting and the agenda of items to be addressed at each meeting. The chairperson will ensure that the agenda for each meeting, and to the extent available, all key documents to be considered in the meeting, are circulated in advance of the meeting to all the other members. A quorum will be required at all Partnership Committee meetings in which decisions are made with respect to the selection of Proponents and the Award of Partnership Contract, as well as approval of any other official action of the Partnership Committee. Members may attend meetings by teleconference or video conference. 3.3 Actions of the Partnership Committee. A quorum will exist at any meeting of the Partnership Committee only if all its members are present. Once a member is present for any purpose at a meeting other than solely to object to holding the meeting or transacting business at the meeting, the member will be deemed present for quorum purposes for the remainder of the meeting and for any adjournment of that meeting. Recommendations of, and approvals by, the Partnership Committee required by the Act will require the affirmative vote of four (4) members present in a duly constituted meeting at which a quorum is present. The Partnership Committee may also act without holding a meeting to the extent such action has been approved in writing by all the members of the Partnership Committee. The Partnership Committee will provide nonbinding recommendations to the Authority regarding the selection of any Proponent, the evaluation of any Proposal, and the establishment of a PPP. The Partnership Committee will keep a written record of the decisions and recommendations made and other actions taken by the Partnership Committee. The Secretary of the Partnership Committee will keep a record of each meeting, keep custody of the Partnership Committee calendar, and carry out any other task related to his or her office, as required by the chairperson of the Partnership Committee. The Partnership Committee meetings will be documented in minutes that will be reviewed and approved by its members and signed by the Secretary of the Partnership Committee after such approval is received. The Partnership Committee and/or the Executive Director will provide the Board with periodic reports of all significant developments in the procurement and negotiation of a PPP. 4.1 Identification of Projects for Public-Private Partnerships. The Authority shall select, evaluate and prioritize the Projects to be established under PPPs pursuant to Article 6(b) [– Specific Powers] and Article 7(a) [– Project Inventory] of the Act, in accordance with the public policy and the goals identified in Article 3 [– Public Policy] of the Act. 4.2 Study of Desirability and Convenience. To assure that a particular Project meets the public policy and goals established by the Act, the Authority will conduct or commission a Study of Desirability and Convenience for each Project selected by the Authority as a potential Project for a PPP. The scope of each such study will be decided by the Authority, on the basis of the particular facts and circumstances of each Project being considered by the Authority for a PPP, and will include, as deemed applicable by the Authority, the matters listed in Article 7(b) [– Study on Desirability and Convenience] of the Act. The Authority may expand the scope of a Study of Desirability and Convenience as it relates to any proposed PPP to include other matters not specifically listed in Article 7(b) [– Study on Desirability and Convenience] of the Act, as appropriate. After the Study of Desirability and Convenience has been completed and the Authority has determined that it is appropriate to pursue the establishment of a PPP in connection with a Project, the Authority will create a Partnership Committee as provided in Article 8(a) [– Creation of Partnerships] of the Act and Section 3.1 of this regulation. The Partnership Committee will have the powers conferred by Article 8(b) [– Partnership Committee Functions] of the Act and this regulation. (iii) using other appropriate methods for gathering information from market participants. 4.4 Qualification of Proponents (RFQ). The Authority may issue a RFQ for a PPP only after it has determined that: (i) the Project meets the requirements of Article 3 [– Public Policy] of the Act; and (ii) it is advisable to pursue the establishment of a PPP in connection with a Project. In anticipation of a RFP or as otherwise required by the Act or the Authority, the Partnership Committee may conduct a RFQ procurement process to identify the prospective Proponents that satisfy minimum standards of: (i) financial condition; and/or (ii) technical or professional ability and experience. Any such minimum standards will be specified in the RFQ and will be related and proportionate to the subject matter of the proposed Partnership Contract. The Partnership Committee may, in addition to such minimum standards, include other qualification requirements in the RFQ and request information about a prospective Proponent including prior defaults, bankruptcies or material lawsuits. All prospective Proponents also must comply with the requirements set forth in Article 9(a)(ii) to (iv) [– Applicable Requirements and Conditions for those who wish to be considered as Proponents] of the Act to be eligible to participate in the RFQ process. The RFQ will be announced by means of a public notice in accordance with the procedures and standards for a RFP set forth in Sections 4.5 and 4.6 of this regulation, to the extent applicable. Consortia and other Proponents who intend to submit Proposals jointly must comply with the requirements of Article 9(d) [– Consortia] of the Act, this regulation and any other requirement specified by the Authority in the RFQ. A Proponent may request from the Authority clarification, explanation or interpretation of any matter contained in the RFQ up to fifteen (15) days (or such greater or lesser period as is specified in the RFQ) prior to the related due date for the information specified in the RFQ. Any such request from Proponents must be made in writing. The aim of the RFQ stage is to help the Partnership Committee short list the best qualified Proponents. Thus, the Partnership Committee, in making its evaluation of the qualifications of a prospective Proponent, may disqualify a prospective Proponent, thereby excluding such prospective Proponent from the RFP process, if the prospective Proponent (i) may be treated as ineligible to submit a Proposal on one or more grounds specified in Section 6 of this regulation; (ii) fails to satisfy minimum standards of financial condition, or technical or professional ability and experience, set by the Authority in the RFQ; or (iii) fails to comply with the requirements of Articles 9(a) [– Applicable Requirements and Conditions for those who wish to be considered as Proponents] and 9(d) [– Consortia] of the Act, as applicable. The Partnership Committee may also disqualify, at its discretion, prospective Proponents in order to arrive at a short list if it concludes that such short-listing will promote a more efficient competitive process. If the Authority elects not to issue a RFQ before publishing a RFP for any Project, the Partnership Committee will make the evaluation of the qualifications of the Proponents as part of the RFP process in accordance with the qualifications requirements contained in the RFP and Sections 5 and 6 of this regulation. If a RFQ process that meets the requirements of Sections 4.5 and 4.6 of this regulation has been carried out for a particular Project, the RFP process can be modified, accordingly. A Proponent that has been qualified pursuant to a RFQ shall not be entitled to indemnity (including, but not limited to, reimbursement for costs and expenses) from the Authority if the Authority decides, in its discretion, to terminate the procurement of a PPP. The Authority, in its discretion, may pay a stipend or fee to the prospective Proponent in the event the Authority decides to terminate the procurement of a PPP. 4.5 Public Notice of Request for Proposals (RFP). The Authority may issue a RFP for a PPP, only after it has determined that: (a)(i) the Project meets the requirements of Article 3 [– Public Policy] of the Act; and (ii) it is advisable to pursue the establishment of a PPP in connection with a Project; and (b) the Study of Desirability and Convenience has been posted on the Authority’s website and a notice has been published in a newspaper of general circulation in the Commonwealth stating that such study has been posted on the Authority’s website, providing the Internet address of the Authority’s website and containing a summary of the key findings of such study, all as required by Article 7(c) [– Publication] of the Act. Except as otherwise provided in Article 9(b)(ii) [– Procedure for Selection and Award] of the Act and Section 4.12 of this regulation, and except to the extent a prior RFQ process for the related Project has been effected by means of public notices, the Partnership Committee will solicit Proposals from Proponents by means of a public notice of a RFP for each Project. The RFP will be published by the Authority in one or more newspapers of general circulation in the Commonwealth, in the Internet at the websites of the Bank, the Authority and the Partnering Government Entity engaging in the PPP and, in the discretion of the Partnership Committee, in one or more national or international journals. The Authority may also employ such other methods and processes, including other means of electronic communication, as it deems advisable in order to disseminate the RFP. The publication and dissemination of a RFP in this fashion is intended to provide reasonable notice to the largest number of potential Proponents that can be reasonably anticipated to submit Proposals as set forth in Article 9(b)(ii) [– Procedure for Selection and Award] of the Act. The Partnership Committee may also solicit Proposals directly from prospective Proponents through a notice of RFP if it believes that such entities may be uniquely qualified to participate in a specific PPP. This Section 4.5 shall not apply to any Project for which a RFQ has been undertaken. In the event that a RFQ has been undertaken, the Authority may, at its discretion, distribute a RFP and related addenda to those Proponents qualified through the RFQ process.